Why Hire A Dating Coach To Help You Find Lasting Love? Why Hire A Dating Coach To Help You Find Lasting Love? Home › Dating Coach › Why Hire A Dating Coach To Help You Find Lasting Love? Technology puts the world at your fingertips — including the world of romance and dating. So why hire a dating coach to help you find lasting love when it’s all but handed to you on a silicon platter? Perhaps you are ready to find “the one,” but feel you’ve wasted your time on almost, and not quite relationships. How do you keep your faith in finding lasting true love, let alone the pursuit of it, if you continue looking where you’ve always looked and doing what you’ve always done? Add to online dating the prospect of meeting someone “out in the real world,” either by chance, work or introduction, and you’ll soon find that there’s a lot to consider in the pursuit of lasting love. Until now, you have probably been winging the effort on your own or leaning on the opinions and sage advice of family and friends. “Why hire a dating coach? You’ve got us!” With all due respect to those who love and care about you, entrusting your love life to your inner circle may be precisely why you should hire a dating coach. Family and friends have a vested interest in the outcome of their advice and introductions. If they are fixing you up with another “wonderful” person, they are looking out for two people they care about, not just one. What are the chances that you are going to be completely honest about your relationship with this person, assuming you at least took the fix-up bait and started dating? You may even remain too long in a relationship that isn’t right for you in an effort not to hurt anyone’s feelings. The role of a dating coach has evolved since online dating began. Instead of doing a lot of the work for clients, coaches are now creating ways to work with them throughout the entire process of finding love. Skype (of Facetime), one-on-one calls, webinars, Facebook messenger, emails and texting provide convenient ways for dating coaches and their clients to connect at every stage of the dating process. While a dating coach is not a replacement for a therapist and working with a coach can actually feel therapeutic. And, some dating coaches are trained life coaches and certified relationship coaches, thus adding to a more comprehensive offering for their clients. When a client “needs to be heard,” it’s nice to have access to immediate feedback from someone who is an objective partner on the journey to finding their life partner. So why hire a dating coach? And what can one do for you if you are on a serious quest for lasting love in the over abundant sea of singles? Am I new to dating, or has it been a while since I have been on the dating scene? Have I done online dating before? If so, how successful have I been? Am I confident in my online profile, or could I use professional guidance? What types of people typically respond to my online profiles? Am I coming off a relationship and don’t know where to begin again? Does my confidence need boosting? Do I trust my ability to choose a good mate? Am I shy or insecure? Do I feel uncomfortable in social situations? Do I know how and where to meet high quality candidates besides online? How do I know what to trust and not trust online? Can I spot the liars or potentially dangerous people? Do I know how to date safely? Am I ready to commit to a relationship? Dating coaches are dating experts. This is their “area,” and they have access to information and resources that can help your dating process be efficient, safe and fun. They provide unbiased input, unlike your family and friends. Their goal is your happiness and success, not a personal agenda. This objectivity provides a safe place for your complete honesty. They can help you identify what you truly want and need, even when you think you have known for a long time. They can help you with your conversation skills. Being able to “talk” is one thing; knowing how to start and participate in meaningful conversations is a skill that takes practice. They can improve your confidence by helping you stretch out of your comfort zone of what you’ve always done. They can give you helpful pointers for creating an appealing and authentic online profile. While you want a profile that stands out, you want one that presents the truth of who you are in the most intriguing light. They can help you analyze dating profiles, messages and behaviors and help you recognize red flags. They can help you create a dating strategy, and be your guide and support system as you employ it. They will be your accountability system. They can provide a safe place to explore and examine your own behaviors in the dating world and to understand the responses you get. They can help improve the relationship you may currently be in by teaching you critical relationship skills you need in order to maintain a healthy, loving relationship. Perhaps most importantly, hiring a dating coach when you are serious about finding true love can help strengthen your self-love. Immersing yourself in the message that you are worthy of love will help you increase self-confidence. And confidence is one of the most attractive qualities of all. If you’re ready to explore working with a dating coach to find true love, reach out to me, Coach Amy. I can help you as I’ve helped hundreds of others who are motivated to marry. You can reach me at https://motivatedtomarry.com/connect-with-coach-amy/. 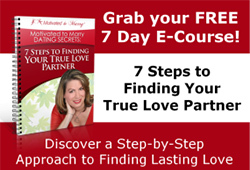 ‹ Why Is Finding True Love So Difficult?